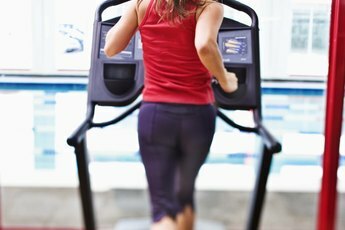 Ellipticals are unlikely to cause tight calf muscles. Exercise is supposed to bring health benefits, so it's frustrating when the hour spent on the elliptical turns into pains in the legs. Don't be quick to blame the elliptical and alter your workout routine; there are several potential causes and fixes to your tight calf muscles. As with any exercise, always consult with your doctor before starting an elliptical routine. There's not a lot of research to link elliptical trainers as being the cause of calf tightness, but the positioning of your lower body does play a role in the machine's effect on your lower-body muscles. While walking and running on a treadmill, your knees extend as you step forward, which stretches the calf muscle; however, your knees stay slightly bent during the elliptical strides. In addition, ellipticals place greater demand on your calf muscles compared to walking, so the combination of the repetitive strides, the unstretched calf muscle and the heavier muscle load could all contribute to tight calves. 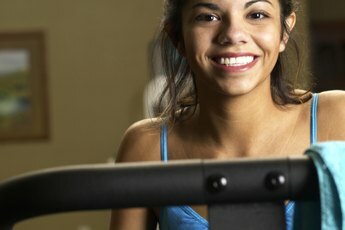 The elliptical being the actual cause of your muscle tightness is less likely than the primary causes of tight muscles. Not following a regular stretching routine is most likely the culprit to your tight lower legs. Muscle cramps can occur on an elliptical and are recognized as a sudden intense tightness of the muscle, which can be caused by muscle fatigue, dehydration, low sodium or low potassium. Another tightness you can experience, especially if you're new to using the elliptical, is delayed onset muscle soreness, or DOMS. DOMS causes pain and stiffness in your muscles for a day or two if you exercised at a higher intensity than usual. Stretch your calf muscles everyday, especially after using the elliptical. A good stretch for the calf muscles is the calf wall stretch. Stand facing a wall with your hands on the wall at shoulder height. Place your toes about 2 inches from the wall and then step backward with the leg to be stretched. Keep your back leg extended as you bend your front knee and lean toward the wall. Keep the heel of your extended leg flat on the floor and once you feel a stretching sensation in your calf, hold the stretch for 30 seconds. Perform this stretch on both legs, three times. Another way to stretch the calf muscles is to wear a plantar fasciitis night splint, which applies a gentle stretch throughout the night. Stretching also provides some relief from tightness associated with DOMS. If your range of motion is limited than you're setting yourself up for tightness. Only use ellipticals that that allow you to stride through your normal range of motion. In addition, use correct posture by tightening your abdominal muscles to stabilize your spine, pulling your shoulders back and keeping your head slightly forward. If you plan to use the elliptical for more than 60 minutes, drink electrolyte replenishing drinks to avoid muscle cramps. If you do have a muscle cramp, don't stretch the muscle during a spasm, since this can tear the muscle, but do stretch as soon as the cramp disappears.